The Highams Park Society, the Friends of The Highams Park and The Highams Park Planning Group have set the dates for some community events in and around Highams Park during 2019 and we have prepared the events calendar below so you can put the dates in your diaries. We will also put a copies in some of the shops, and on the noticeboards by Tesco, Hale End Library and in The Highams Park! With special thanks to Brian Goldstein of Whisper Creative Design for doing the poster for us. 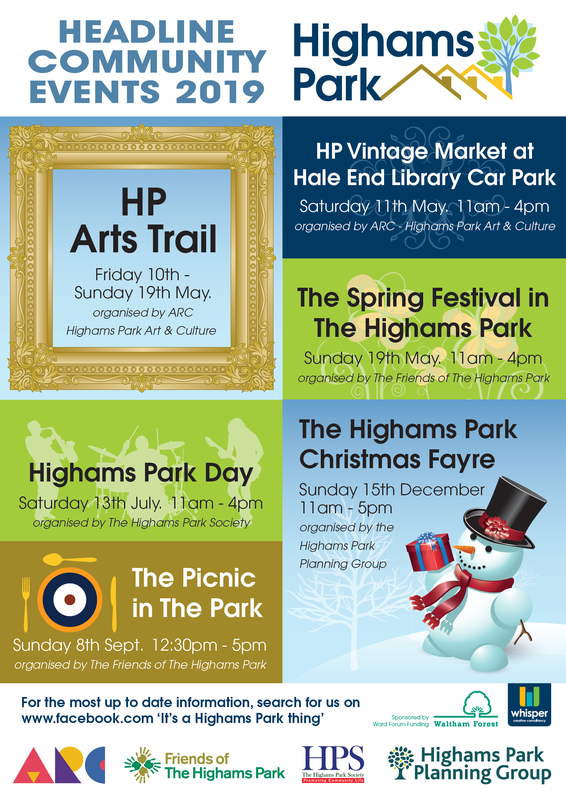 Friday 10th May to Sunday 19th May – The Highams Park Arts & Culture Trail, organised by ARC (part of the Highams Park Planning Group). Sunday 19th May – The Spring Festival in The Highams Park, organised by The Friends of The Highams Park. Sunday 15th December – The Highams Park Christmas Fayre from 11:00 am until 5:00 pm organised by the Highams Park Planning Group.